Research in the Sloan Automotive Lab is closely partnership between industry and government. There are three major research consortia which provide long term continue support in specific areas, and individual focused projects. The close partnership keeps the research activities relevant so that the work would have direct impact on transportation system technology and policy, and relates the students to the active participants of the industry. View a complete listing of all Sloan Automotive publications (PDF). LNF Ecotec intake stroke showing direct fuel injection. Potential of alcohol fuels in downsized turbocharged engines to increase compression ratio, increase downsizing+boosting or both. Research themes and individual projects evolve through discussions with Consortium members at regular meetings held every four months. Relative emphasis on each theme area (e.g. 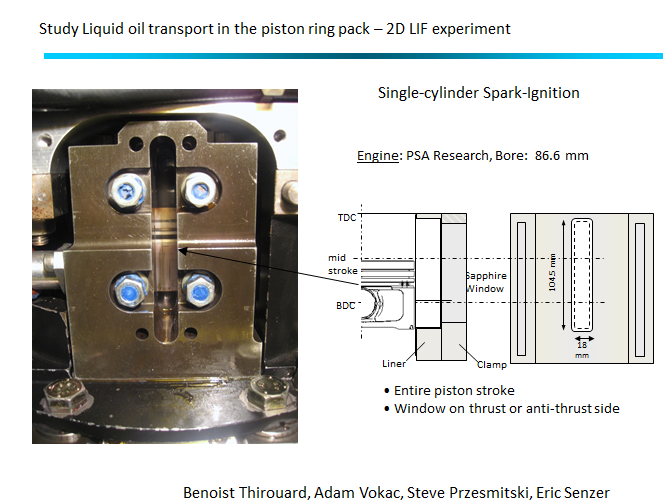 port fuel injected spark-ignition engines compared with direct-injection engines, diesel-related projects) is reviewed periodically, and individual project proposals are presented, discussed, selected, and improved. Projects are either Masters degree theses (1-2 years), or Ph.D. degree theses (3-4 years), and occasionally shorter term activities. For access to consortium software, presentations, and other materials please visit this page. Contact wkcheng@mit.edu for access. Consortium members may login and view additional content here. Guests may sample some of the additional content here. Dr. Victor W. Wong will assist you with user names and passwords. (1) The detailed characterization of the evolution and properties of ash compounds in the exhaust aftertreatment system, their sensitivity to lubricant/additive formulations, catalysts, substrates, duty-cycles and effects on aftertreatment system performance and regeneration. Carefully controlled experiments using a combinations of test benches with simulated exhaust and multicylinder diesel engines are performed. Detailed computer simulations are conducted in parallel to describe and understand the phenomena. (2) Modeling and diagnostics of lubricant composition changes in the engine due to contamination from fuel and combustion products, as well as degradation and oxidation. 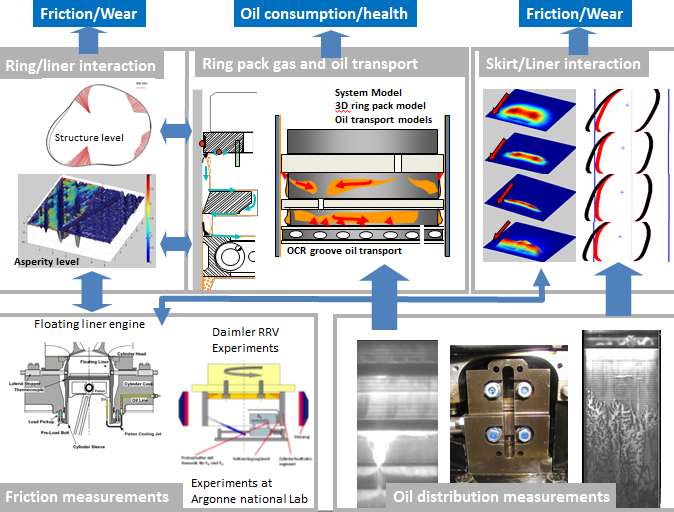 (3) Modeling and validation of engine-oil interactions: additive and material surface design and mechanisms affecting wear, deposits, and friction. The detailed computer simulations include the lubricant/additive species transport and transformation processes in the engine, degradation, oxidation and volatilization of oil and additive compounds, as well as deposition and deactivation mechanisms of ash on aftertreatment catalyst, washcoat and substrate systems. Aftertreatment system performance on a heavy-duty diesel engine and oil composition measurements via sampling in the ring pack have been made. In-situ diagnostics currently being developed include FTIR (Fourier Transform Infrared Spectroscopy) oil analysis at the piston-liner interface via Attenuated Total Reflection (ATR) and other spectroscopic techniques. This research program builds upon, extends, and complements other studies conducted elsewhere or at sponsor organizations. 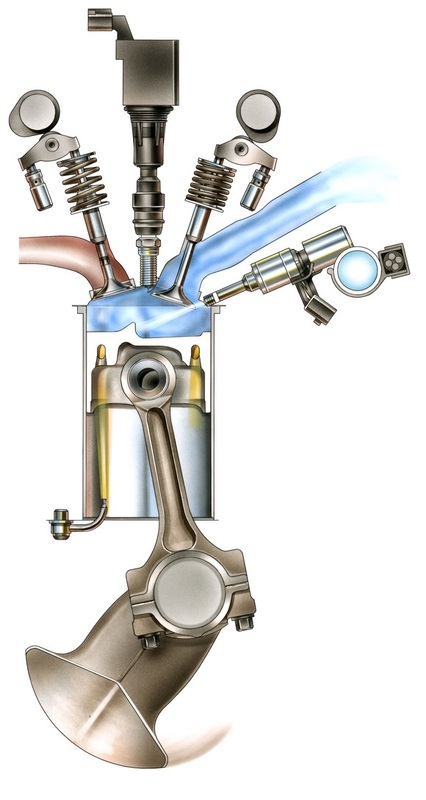 The fundamental understanding so developed will be useful to participants in optimizing the combined lubricant/additive, engine, and aftertreatment system. Contact: Dr. Victor W. Wong -Tel: 617-253-5231, Fax: 617-253-9453, Email: vwong@mit.edu for further information. The goal of the consortium is to develop knowledge and analytical tools for the engine lubrications systems to help the product development of our industry members. Our approach is to combine the efforts from experiments, modeling, and close interaction with our industry members. While constantly improving and adding new physics to the models, many of our models have been effectively applied in our member companies for more than a decade. On the experimental side, our single cylinder engine with optical window and 2D LIF diagnostic system continuously provide us further insights to the oil transport in the piston ring pack as well as in the piston skirt region. 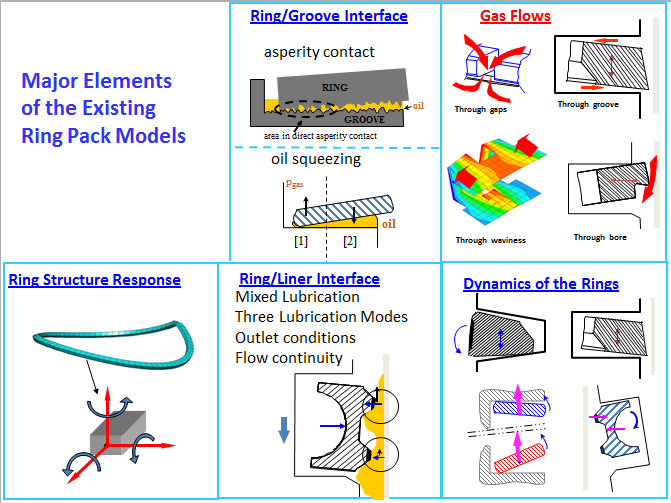 We recently added a floating liner engine (FLE), which allows us to examine the effects of liner finish, piston rings, and piston skirt designs on friction, and to validate and improve our models. Due to project disclosure agreements, not all projects are listed here. Bulk low temperature combustion without the presence of flame in engines could lead to high fuel conversion efficiency and low emissions. This project assesses the effect of charge stratification in alleviating the undesirable high pressure rise rate in such combustion system. The lubricant requirement in terms of the properties of base oil, viscosity/friction modifiers, and detergent is different for different parts (e.g. valve-train and piston/liner) of the engine since the local operating environment differs significantly. This project first establishes the local requirements and formulates the best individual lubricant formulation according to each local requirement. Then a single optimum lubricant package is sought via a global trade off of the extent the package would address the local lubrication requirements. Substantial gain in spark ignition engine fuel conversion efficiency could be obtained by increasing the engine load by turbo-charging. The strategy, however, is limited by engine knock. Alcohols can suppress knock both by cooling the charge because of its high latent heat of vaporization and because of its chemistry. Operating the engine with gasoline with supplemental alcohol fuel injection at high load is an effective means of suppressing knock. With the use of very high injection pressure in advanced diesel injection system, the nozzle holes are getting correspondingly smaller in diameter and thus more prone to deposit caused deterioration. Fuel detergent can alleviate the deposit formation problem by suppressing the formation process (keep clean), and by removing the deposit (clean up). The physical and chemical processes of the detergent action are studied in this project. Significant amount of diluents such as recirculated exhaust gas and water vapor is often present in SI engine operation. A generalized correlation is sought to relate the engine behavior to the diluents to simplify the engine calibration process. The tribology of the apex and face seals in a Wankel rotary engine is challenging. The oil film behavior of a firing engine is visualized to study the oil film thickness and transport. The data are used for developing a comprehensive lubrication model for these seals. This project is part of a sustainable mobility research initiative undertaken as part of MIT's Alliance for Global Sustainability (MIT/AGS) program. The Before-H2 research team is interested in near- to medium-term solutions that would curb petroleum and energy use, and greenhouse gas emissions from the transportation sector. Lead project participants are MIT and the Paul Scherrer Institute (PSI) near Zurich, Switzerland. At MIT, the focus is on the U.S. light-duty vehicle fleet over the next 20-30 years. The objective is to model and predict the potential impact of future alternative fuels and vehicle technology developments on fuel consumption, greenhouse gas emissions and propulsion system, and examine policy measures that may influence the adoption of these technologies. Similar studies focused in Europe are in progress. For more information, please visit the project's web site here. ©2012 Sloan Automotive Laboratory, Massachusetts Institute of Technology.